The Atlas Copco LWP 2 submersible pump rental is available in Rochester NY, Ithaca NY and Upstate NY from the Duke Company. Hydraulic pumps offer a greater degree of reliability. The Atlas Copco LWP 2 submersible pumps are used in a wide range of applications. They are great at continuous pumping of clean or contaminated water; as well as flooded excavations and cellars. 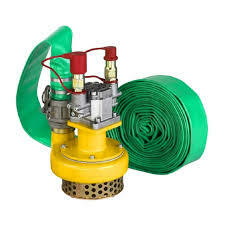 The two inch submersible water pump can handle stones and debris of up to 3/8 of an inch. It’s an ideal all-round pump for municipalities, rescue services , water and waste utilities. Other uses include general construction and road services/maintenance work.